What does Jackie O’s signature Cartier watch and tiny lettuces that retail for almost $50 a pound have in common? Behind each is a story steeped in business relevance, cultural influence, and a dash of splendor. Backed by research and expertise, Bloomberg Pursuits editors and writers unpack these rich stories and why they matter to appreciative audiences. This unique variety of intelligent luxury journalism was on display recently at two events that highlighted key lifestyle trends – and how the multimedia brand is covering them in new and exciting ways. Bloomberg Pursuits’ Emma Rosenblum moderates a panel discussion at Christie’s with (from left) Christie’s Tom Burstein, Bloomberg’s Chris Rovzar, and Christie’s Eric Wind. Photo: Tiffany Sage/BFA NYC. In the first, a sparkling jewelry-and-watch auction preview hosted in partnership with Christie’s, Bloomberg Pursuits invited discerning consumers to experience rare pieces up close – and find out more about craftsmanship, luxury trends and investing in luxury. 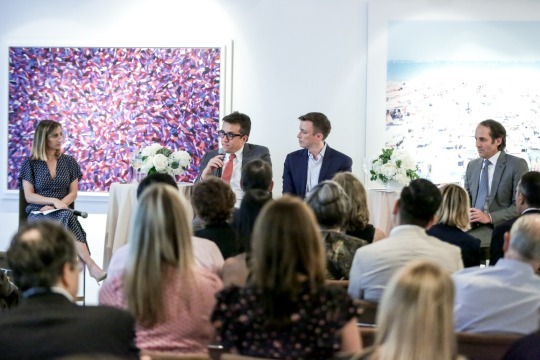 Bloomberg Pursuits editor-in-chief Emma Rosenblum led a panel that included Bloomberg’s Managing Editor of Global Luxury Chris Rovzar, Christie’s US Jewelry Department Head Tom Burstein, and Christie’s Senior Watch Specialist Eric Wind. 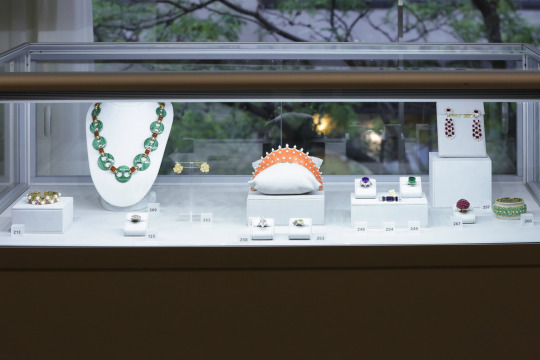 Colorful jewels on prominent display at Bloomberg and Christie’s event. Photo: Tiffany Sage/BFA NYC. Following the panel, the audience was invited to a reception featuring magnificent pre-sale jewelry and iconic watches. On display: a Cartier “tank” watch owned by Jackie O. “That watch is what popularized the Tank,” said Eric Wind, Christie’s Senior Watch Specialist. “It is probably the most important Cartier watch today.” Alongside the priceless piece were a gold Rolex that cost $600 retail in 1969, now with an estimated value of $400-600K; and the 18.04-carat Rockefeller Emerald— the real deal among named gemstones. Event sponsors XOJET and Terranea Resort integrated seamlessly into the gathering with relevant, one-of-a-kind gastronomic experiences that provided unique value to well-heeled guests. 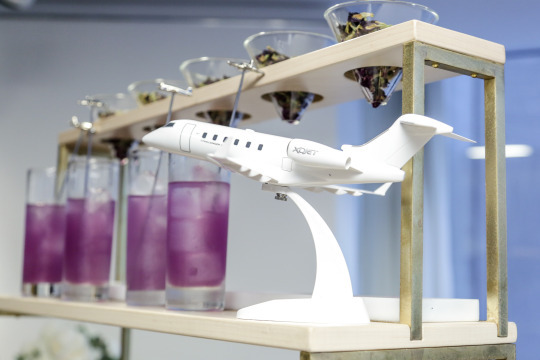 XOJET brought guests a custom “pour over” station – a dramatic visual presentation that evoked elite travel. The “Challenger 300” cocktail was poured over a bitters-cotton candy cloud, while the “Citation X” was poured over butterfly pea flower tea. Each drink arrived with a silver airplane-topped swizzle stick for a smooth landing. 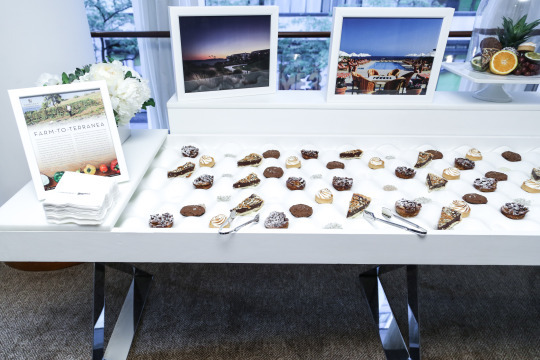 Terranea Resort gave guests a taste of pacific paradise through its “Salty & Sweet” dessert bar, a cool display of delectable treats baked with Terranea’s signature sea salt. Each dessert laid atop a bed of salt harvested off the shores of Terranea, rounding out the full oceanfront experience. XOJET-sponsored “Pour Over” station at Bloomberg Pursuits event in partnership with Christie’s. Photo: Tiffany Sage/BFA NYC. Terranea Resort’s custom “Salty & Sweet” dessert bar at Bloomberg Pursuits event in partnership with Christie’s. Photo: Tiffany Sage/BFA NYC. At the second event, a group of luxury brand marketers attending an intimate breakfast in New York learned what resonates most with luxury consumers and saw an exclusive preview of forthcoming content from Bloomberg Pursuits editor-in-chief Emma Rosenblum and her team, including deputy editor James Gaddy, who covers fitness and adventure travel; travel editor Nikki Ekstein; food editor Kate Krader; cars and bikes editor Hannah Elliott; and arts and culture editor James Tarmy. For Bloomberg, Rosenblum explained, the best luxury content isn’t just about what’s hot. Pursuits’ readers are interested in a mix of service journalism and deeper dives into the stories behind the story. 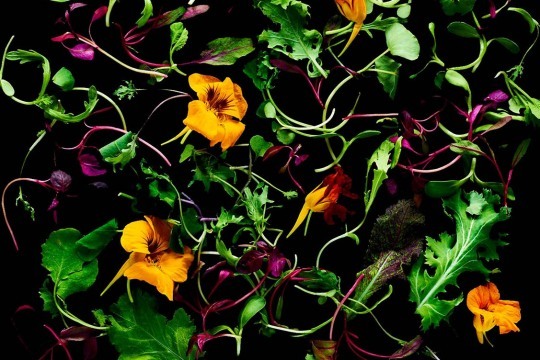 Magic Greens, by Kate Krader. Photo: Ted Cavanaugh/Bloomberg Pursuits; Food styling by Diana Yen. For example, travel writer Ekstein shared an upcoming Bloomberg Pursuits feature for which she traveled to Chiang Rai Elephant Sanctuary– a reserve in Thailand that offers once-servile elephants and their human families the space and resources to live safely and peacefully, while also supporting responsible wildlife tourism. Ekstein said: “I like to reflect on people’s bucket lists, and then figure out how people can do them in the most intelligent way.” That means trust – trust that it’s a great luxury experience, but also trust that money is being spent in a way that’s socially and environmentally responsible. “Our audience has a lot of money – and they are very willing to spend it, if they feel they are getting good advice,” added Rosenblum. Three for the Road, by Hannah Elliott. Photo: Matt Goldman/Bloomberg Pursuits. 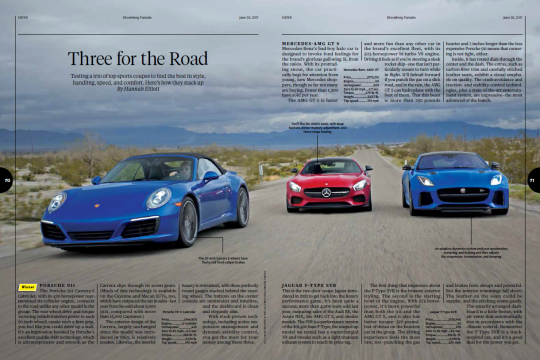 And thanks to an enhanced multiplatform experience in 2017, elite consumers can now find inspiration at every turn: in Bloomberg Businessweek— whose June redesign boasts a new ten-page Bloomberg Pursuits section – as well as online, in-app, via digital video and in a just-launched television show timed to the weekend mindset. Rosenblum previewed an edit calendar packed with covetous features like a style guide for fall’s best fashions, a foodie bucket list, a how-to for buying fine art, and an insider look at high-class travel. Bloomberg’s new content partnership with HODINKEE— announced earlier this year— enables readers to enjoy additional watch coverage from the premium watch and timepiece publisher, like a Vintage Watch Explainer in October. At their core, Bloomberg Pursuits editorial topics anticipate and reflect the enthusiasms of its audience, uniquely achieved through a direct line of communication. Every story links to its author’s email address, and Bloomberg readers frequently reach out to share feedback and anecdotes.